As a reminder for those that may have forgotten, and for those who do not know; tomorrow 6 January is the Feast of Epiphany, also called The Feast of the Three Kings. 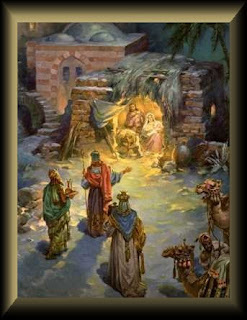 It is the day that celebrates the manifestation of deity in human form through Jesus Christ the Son. According to my mother it is also the day that you are supposed to take down your Christmas decorations, or if you have done so already, then you should of left one item up until tomorrow, otherwise it is bad luck! It is also bad luck to leave the decorations up past 6 January, so better take them down tomorrow. LOL. The day of 6 January is a really good time to for making holy water that can be used in ones magical practices. This water is known as triple kings-water. I found this out from Joseph Peterson's edition of “The Sixth & Seventh Books of Moses” which is stated in the notes section page 297. But why is the feast of the Three Kings held on January 6. This is because divinity is shown here in the trinity aspect of mind, spirit & soul, symbolized as the Three Kings, and which always manifests in twelve stages. Hence the reason why there are twelve signs of the zodiac, twelve tribes of Israel, twelve legions of angels and the twelve apostles. Therefore 6 January is 'twelve' days after the Christ Divinity is born. I wrote about this around this time last year on evocationmagic.com and now I have a blog I thought it would be a good idea to post this information up here, as a reminder for any other magicians that may want to create some holy water for the beginning of this year, as it is an ideal day to do it on. In addition to this and blessing my home, I also use it to consecrate my altar, and new items of magical equipment that I lay out on my altar. 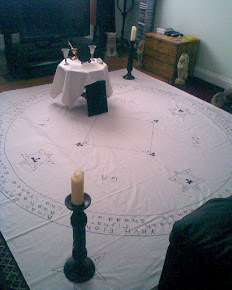 The form of ritual I use for this is taken from Mr Skinner and Mr Rankine's edition of “The Veritable Key of Solomon” Chapter X Concerning Prayers in the form of Exorcisms in order to consecrate everything used in the Operations of the Great Art. It is a very short and simple ritual to do, and perfectly adequate for any new items that will be used in ones magical ceremonies, such as new candles, incenses, parchment and oils ect ect.